It’s also the perfect way to define the participants, volunteers and supporters who have made Distinguished Young Women an enduring success for more than 60 years. Throughout our history, volunteers have helped thousands of young women find their path to a distinguished future. As we celebrate the past, we also look to the future of the program and the generations to come. 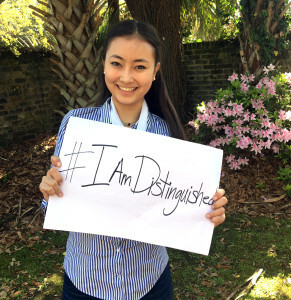 Distinguished Young Women remains free for participants who have a chance at more than $1.5 billion scholarships each year. You can make those efforts even greater by donating your resources, time and even the story of your experience with a young woman who could benefit from our program. You can see daily photos of participants and current volunteers on our Facebook and Instagram pages with their answer to a simple question: “Why do you support Distinguished Young Women?” And through the #IAmDistinguished hashtag, you can post your support to Facebook, Twitter or Instagram in the form of a photo and your answer. Won’t you join us in creating successful futures for young women?